Everyone's tried to sneak something through the airport before -- a nip of booze, maybe liquids in excess of 3.4 ounces, possibly a snack you're then fined $500 for -- but we would wager that you've never tried to sneak 70 birds past security. 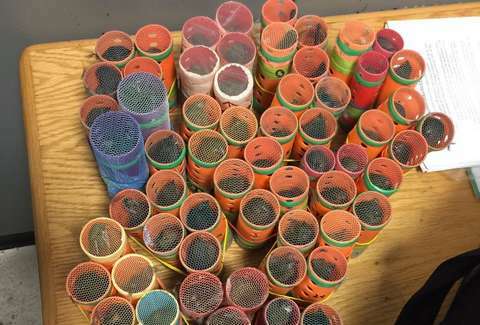 A passenger coming from Guyana and traveling through JFK in New York on Saturday, however, was caught with 70 finches secreted away in plastic hair rollers, according to a statement by the U.S. Customs and Border Protection. The Washington Post reports that in the past year and a half, over 200 finches have been seized in New York under similar circumstances. “CBP Agriculture Specialists are the first line of defense to prevent the introduction of animal diseases that have the potential to cause significant damage to the Nation’s agricultural economy,” Troy Miller, Director, Field Operations, New York Field Office said in the statement, which went on to cite the 2015 outbreak of Highly Pathogenic Avian Influenza, also known as bird flu, that caused $850 million in damages. According to the Washington Post, the passenger wasn't allowed to enter the US this time, but he will be able to reapply to visit in the future. He's been subject to a fine, but beyond that, there were no penalties. As for the birds, they were turned over to the United States Department of Agriculture Veterinary Services.